Makes A Fabulous Snowmobiling Experience! 5 Lakes Lodge brings a whole new meaning to the term SNOWMOBILING. 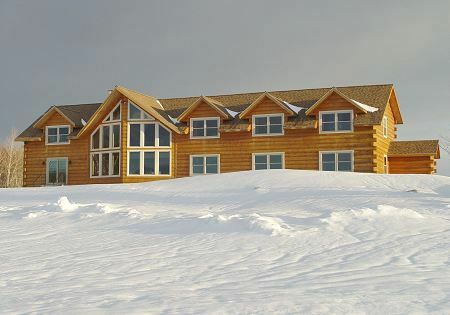 You'll be spoiled forever by a combination of luxury seldom seen along the trails plus some of the best groomed, and most scenic, snowmobile trails you will ever ride. Your hosts, Rick & Debbie LeVasseur, are long time snowmobilers who have been grooming the Katahdin area's snowmobile trails for twenty years. 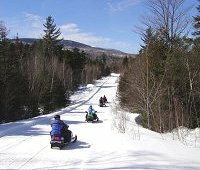 They know what it takes to ensure that you have a great snowmobiling experience in the Katahdin Region. 5 Lakes Lodge is located midway between ITS 86 and ITS 83 on the uncrowded "Katahdin Loop Trail". 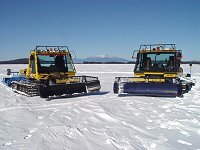 We serve as the home for the Jo Mary Riders Snowmobile Club, and have two big Bombardier trail groomers on site. Our dedication to trail grooming is second to none. Our trails are wide, flat and very well marked. Although we're only seven miles from the town of Millinocket by road, by trail we're quite a ways from any of the other lodging facilities. Our guests enjoy the ability to get "First Tracks" out of the lodge on most mornings. 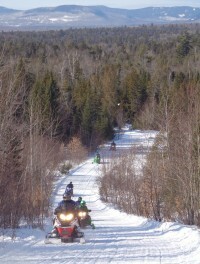 For more scenery, trail info and trail maps, visit our Katahdin Region snowmobile trail page. 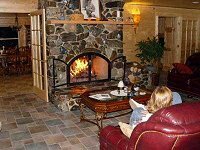 5 Lakes Lodge offers the finest accommodations in Maine's Katahdin Region. This authentic log B & B features five luxurious rooms, all with commanding view of snow covered lakes and majestic Mt. Katahdin within Baxter State Park. The interior carries the natural mountain atmosphere inside with a rustic yet elegant Maine Lodge look and feel, highlighting rich earth tones and natural touches like all wood paneling and a two-story river-rock fireplace. The exterior features massive spruce logs accented with natural stone and an abundance of glass. 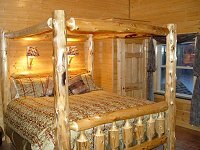 Check out our home page for more info about 5 Lakes Lodge Bed & Breakfast. "It's difficult to conceive of a region uninhabited by man. We habitually presume his presence and influence everywhere . . . But here not even the surface had been scarred by man, but it was a specimen of what God saw fit to make this world." Henry David Thoreau wrote that on his first visit to Mt. Katahdin in 1846. Not much has changed in the past 160 years. Simply put, Maine's Katahdin Region is a very special place. Mother Nature has blessed us with an abundance of natural beauty; crystal clear lakes, lush forests, magnificent mountains and powerful rivers. Small communities. Friendly people. A clean environment. No traffic. No crowds. No rat race. Abundant wildlife. And a myriad of recreational opportunities. 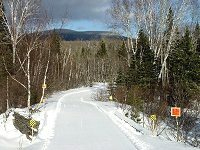 5 Lakes Lodge is located directly on the Katahdin Loop snowmobile trail in the area known as the Katahdin-Jo Mary Forest. Routes 11 & 6 form the boundary of the largest area of undeveloped wilderness east of the Mississippi River. And it's right at our doorstep. Yet, we're conveniently located just 20 miles from I-95 (exit 244), 75 miles from Bangor International Airport, two hours from Bar Harbor and an easy five hour drive from Boston. Millinocket Regional Airport, with a 5000 ft. runway, is just 8 miles away. Charter flights are readily available. Visit our Snowmbiling Gallery for lots more Snowmobiling and Trail Scenery Photos. Read SnowGoer Magazine's October 2015 article "Maine's Magic Carpet Ride" about riding the Katahdin area trails. Read about Rick Levasseur's Snowmobile Trail Grooming Award. 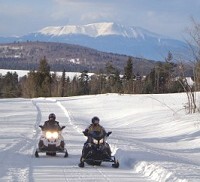 Scenery and trail maps at Katahdin Region snowmobile trail. Read more about the Award Winning Accommodations at 5 Lakes Lodge. If you're looking for incredible snowmobile trails, inspiring scenery, warm hospitality and rustic elegance, 5 Lakes Lodge Bed and Breakfast, is a wonderful place to experience the best that Maine has to offer.